Dozens of farmers and ranchers from across the state sat in the Senate gallery today after lobbying legislators to help them find a solution to their soon-to-be expired water permits. Donning a white cowboy hat and brown leather boots, Kauaʻi rancher Bobby Farias took a day off from herding cattle. He instead spent his morning meeting with the governor. Water that Farias and dozens of Hawaiʻi farmers and ranchers could lose when permits run out in December. For Farias that means uncertainty. Farmers and ranchers from Kauaʻi, Maui, and the Big Island converged on the State Capitol to ask Ige and Hawaiʻi lawmakers for help. One solution is to revive House Bill 13-26, a measure extending water permits another seven years. Opponents of the bill had concerns over water permits for large landowners like Alexander and Baldwin. 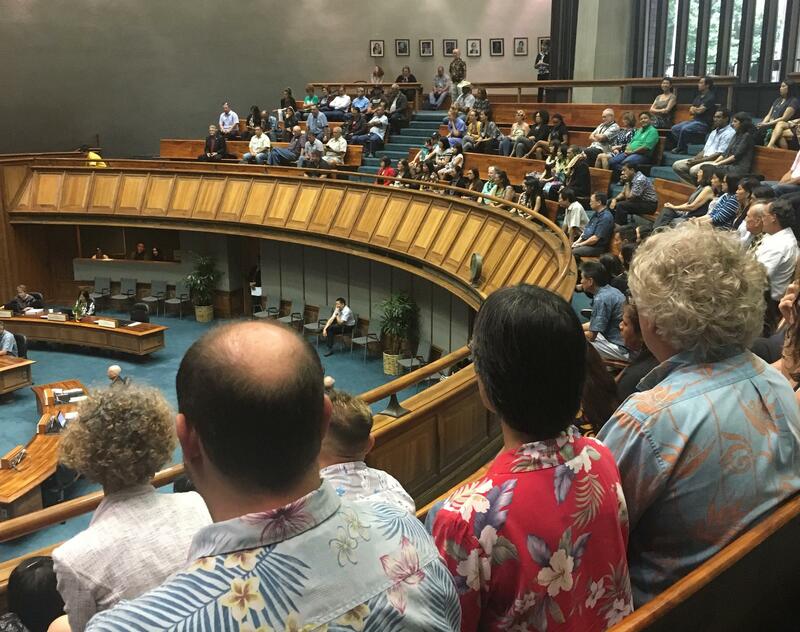 But Big Island Senator Russell Ruderman says, even when legislators amended the bill to remove A&B, a vote on the measure was deferred by the Senate Ways and Means Committee. “Considering where we’re at, it’s now an Executive Branch problem that the Governor’s office and DLNR have to resolve,” says Sen. Ruderman. He met with the group’s Big Island contingent including Kaʻū rancher and Hawaiʻi Farm Bureau President Randy Cabral. But they’re not giving up. Hawaiʻi’s farmers and ranchers say they desperately need a solution. “If we don’t get something passed, the Governor doesn’t do something administratively, then the possibility of us having no water at the end of the year, it’s there,” says Cabral. The legislative session ends in less than three weeks. Legislation to preserve rights for private users of Hawai’i’s fresh stream water died yesterday. State lawmakers are weighing a bill that would allow a dozen private users statewide, including Alexander and Baldwin, to continue to divert fresh stream water temporarily. The interim permits would remain in place until the state can issue long-term water leases. Critics say the measure ignores the impact even temporary diversions can have on public trust uses like taro farming.